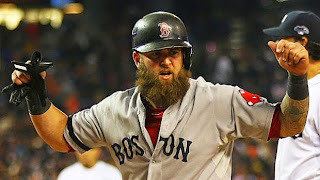 Most baseball players are strong but few are strong like Mike Napoli. Case in point, Napoli hit a broken bat home run yesterday over the monster. Yeah, you heard me. He hit it OVER THE MONSTER with a broken bat! Keep in mind that this Green Monster is 43 feet high, 6 feet higher than the one up in Boston. If Mike Napoli is swinging the bat like this, preferably a bat that is not broken, the Sox lineup is in pretty good shape.